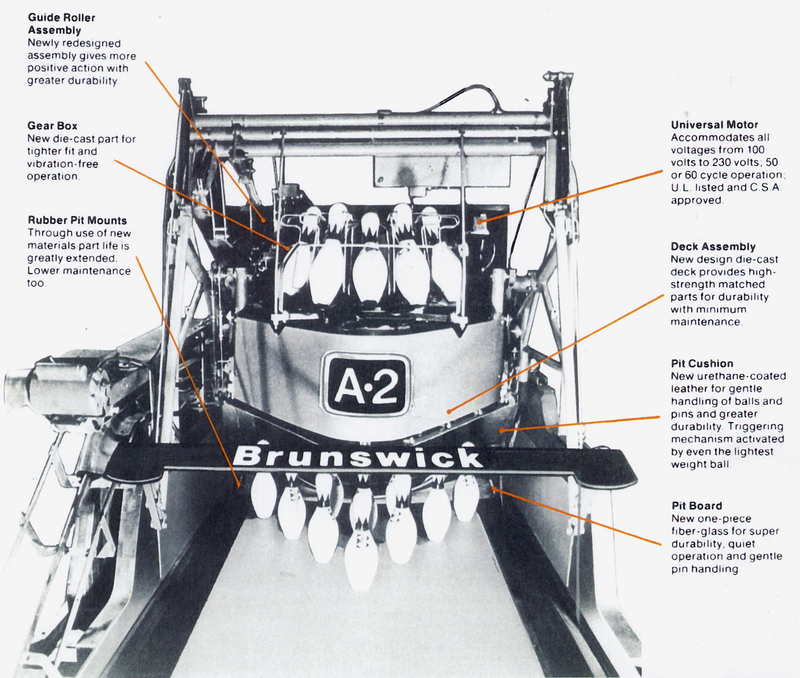 One of the greatest and most important inventions in the history of bowling was the development of the automatic pinsetter. Now the bowling alleys could operate 24 hours a day and weren’t beholden to finding and keeping good pinboys. As early as 1909, there were a good number of manual pinsetter and automatic pinsetter inventions. Some of the inventors were Ernest Hedenskoog, Frank Hobbs, Angus Cameron, J. C. McFarland, Jakob Heinemann, Walter Wheeler, Harry and Frank Estabrook, Howard Redfield and others. The most prolific of these was Norwegian inventor Ernest Hedenskoog. He was put on the payroll of Brunswick in 1911 as the “in house” inventor and was responsible for many of the Brunswick patents including the B-1 and B-10 semi-automatic pinsetter used by pinboys of the time. In the late 1920’s, Brunswick had an automatic that was actually installed in a bowling alley. Photographs of this pinsetter can be seen in the “Bowling Is Our Business” video listed in the video section. In 1931, a bowling alley proprietor from Pearl River, New York named George Beckerle often had problems obtaining enough pinboys. One of his bowlers, Gottfried Schmidt worked across the street at a factory which made machinery for the paper folding industry. They had discussions about making a pinsetting machine using suction like the paper folding machines used. A draftsman from the company, John McElroy drew up some blueprints for the new invention. They assembled and tested the “machine” at an unused turkey house on a Pearl River farm. Schmidt then visited Bob Kennedy who worked for Brunswick. But Kennedy’s bosses at Brunswick were not interested in an automatic machine at that time. In 1937, Kennedy left Brunswick to work in the sales department of the American Bowling & Billiard company in New York. One day, he looked up Gottfried Schmidt again. Schmidt’s lawyer suggested they contact Morehead Patterson from the American Machine & Foundry Company who was Vice-President of AMF. AMF then acquired the patent rights to this early machine - it was originally made with flower pots and lamp shades. Here’s a rare photo of the machine. 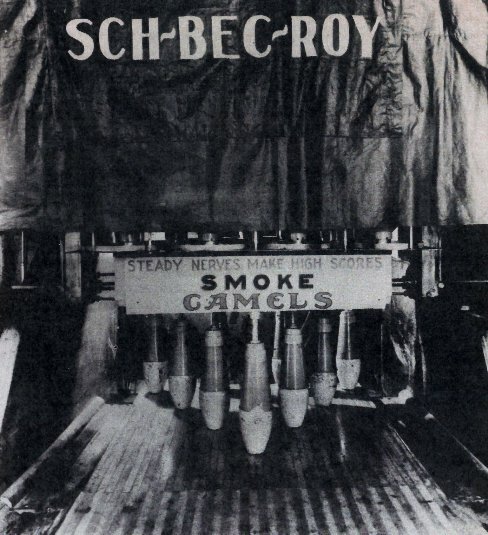 The “Sch-Bec-Roy” stands for Schmidt-Beckerle-McElroy. The pinsetter program was stopped due to World War II, and then resumed in 1944. An addition to the AMF bakery equipment plant near Buffalo, NY became the pinsetter production center. In 1946, the new pinsetter was unveiled to the public at the ABC Tournament in Buffalo using a garage near the Armory where the tournament was held. The 2 new Automatics on display were 7’ 9” tall and weighed more than two tons each. Several newsreels were filmed and later a Columbia Pictures “short” was filmed -narrated by Bill Stern for theatrical release. A rare newsreel video is available in my “video” section showing all the inner workings of this great machine (using suction and a revolving turntable). A 5 page booklet is also available with the complete AMF 1931-52 Pinsetter story. The 1946 “suction” pinsetter was found to have some problems of breaking down in the “real world” of continuous play. So, by July of 1948 an entirely different model was developed. Here’s an excerpt from a December 1947 article in Barron’s magazine talking about the upcoming year 1948: “Back to the drawing board went the pinspotter where it acquired a new mechanical lifting principal (see info about Michael O’Leary below) as well as several features which AMF had purchased (see the “rest of the story” below). Now the company intends to devote most of 1948 to experimentation.” You can see the details of the 1948 pinsetter in the patents of Sanders Frye (also named as S. A. Frye) on my Patent CD . Later in 1948 and 1949, Thomas Flint and John Fluke patented their “new” ideas and features which you can almost recognize in the 1952 (and later) AMF Automatics. The big break-thru came in 1950 with inventor Robert Holloway who patented most of the mechanics & systems used in the 1952 production model. And John Zuercher patented the “finishing touches” in his 1952 patent submission. In August 1952, the production model of the AMF pinsetter (called the “Pinspotter”) was finally ready. All these patents can be seen on my Patent CD. When AMF was starting to become successful with their automatic starting in the late 1940’s, Brunswick hired a small firm from New York - Huck Engineering. The Huck company discovered that Hedenskoog’s patents actually contained some good ideas and started work on a prototype. In 1953, they had 2 machines that worked, one of which was to become the model A. These 2 very different machines can be seen in operation in the “Bowling Is Our Business” video in my “videos” listing. To design a model for mass production, the Otis Elevator Company was called in to help. The first Brunswick Automatics were installed at Roselle Lanes (16 lanes) in Roselle, New Jersey in April of 1956. When AMF was showing their 1946 machine to the public In Buffalo, New York there were 2 other companies showing films and articles about their own automatic pinsetters. One was the Automatic Pinsetter Company from Camden, NJ and the other was Wolab Corporation which built a machine for the L.L. Leveque Company from Columbus, Ohio. AMF later bought out the patents of both these companies. Articles from 1946 of the Columbus, Ohio automatic are available on the “articles” listing page. This Columbus automatic seems very similar to the AMF 1952 production model. The designer of this machine, Leslie L. Leveque was killed in a plane crash in May of 1946. 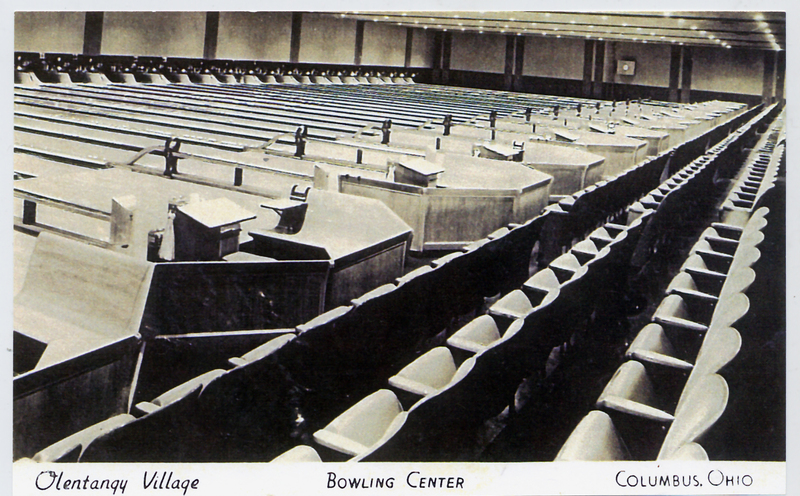 Some bowlers at the Olentangy Village alleys remember some of these pinsetters were installed there in the late 1940’s. I personally talked with Robert Stickney from Ohio a few years ago & he remembers how great those early pinsetters worked in 1948. Whether or not those memories are accurate, Charlie Allen of The Ohio Bowler stated that the late Sanders Frye (who worked on the pinsetter project) told him that the LeVeque machine provided key details that AMF needed to perfect it’s pinsetter. Frye also told Allen that after LeVeque’s death, the Columbus pinsetter patent was sold to AMF. Michael O’Leary of Springfield Ohio was the inventor of the moving sets of bars which would pick up the pins still standing (even if off-spot) after the 1st ball was thrown. And they would be replaced in the same exact place even if they were off-spot. He said he “never went to college, but had his name on 8 patents”! He said he invented this mechanism using 2 pencils. And this was the problem which had plagued pinsetter development for over 40 years - putting standing pins back in the same spot they were found after the 1st ball! The whole Ohio story is available in the “articles” page.